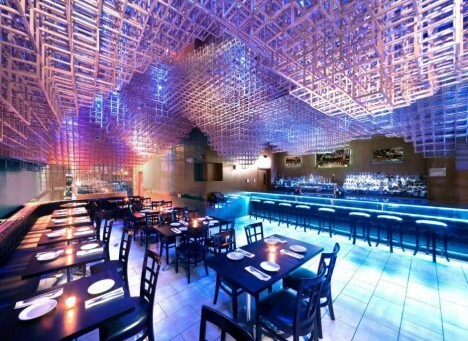 At one restaurant in Berlin, you might spend more time gazing up in wonder at an undulating ceiling installation made from over 14,000 chopsticks than you do at your dining companion. 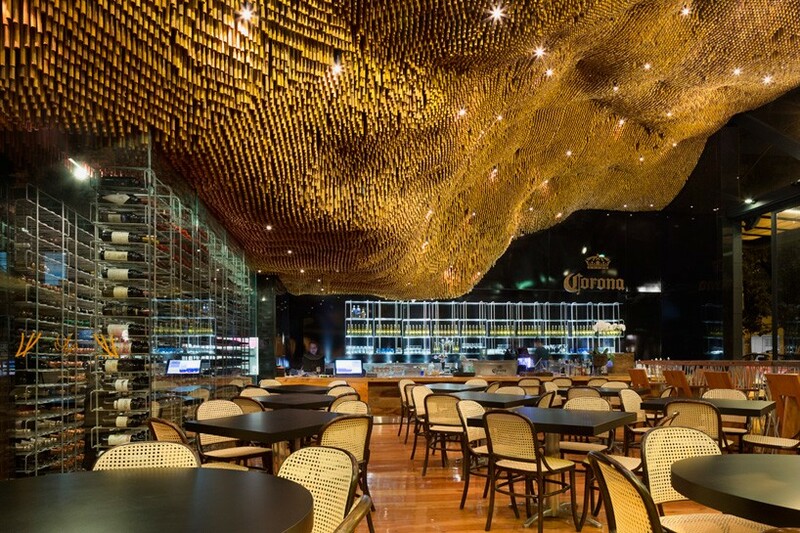 Ceilings are often an afterthought, but these 14 (more) modern ceiling designs and installations completely transform the feel of each space, making restaurants, retail shops and even churches feel more like art installations than conventional interiors. 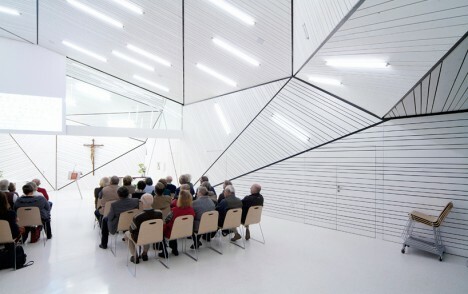 Feeling a bit like it’s located on a spaceship, the Pastoral Care Center in Linz, Austrlia by X Architekten features a graphic geometric arrangement of striped white panels that make the spatial limitations difficult to discern. 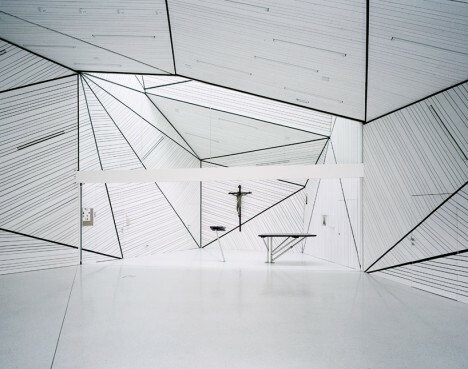 All inside surfaces are white and furniture is minimal to create a meditative atmosphere. 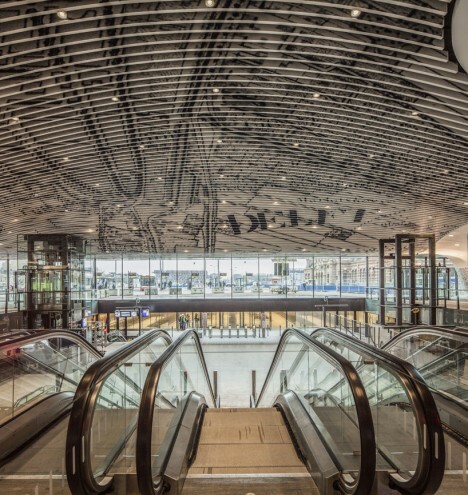 “Similar to fractal geometries,the ceiling installation in its layered layout is self-similar and recursive in the sense that its formal behavior is the same from near and from afar, and further exists within the fractal non-differentiability if one considers the essential multiplication of each member as its distance from the viewer increases,” says design firm BlueArch of its installatiion in a New York restaurant. 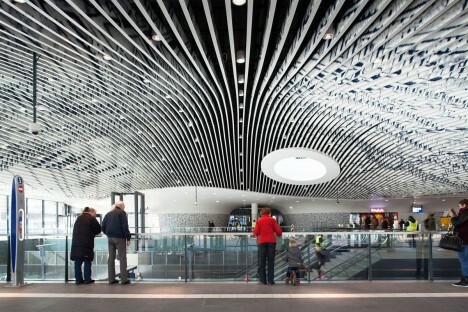 They also integrated an LED light system into the poplar-cloud structure. 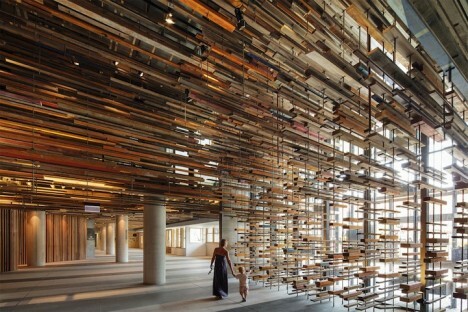 Australia firm March Studio hung 2,000 pieces of reclaimed wood from the walls and ceiling of the Nishi Building in Canberra, creating cascading installation that almost seems to capture a structure mid-explosion. 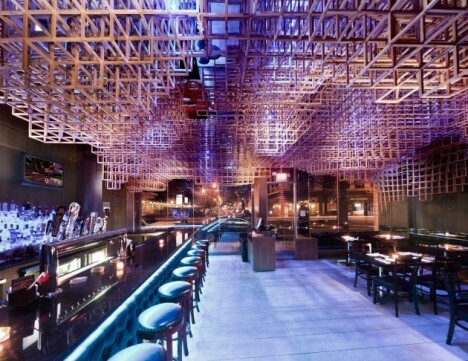 The boards were all recycled from demolished homes, a basketball court and the construction site of the Nishi itself. 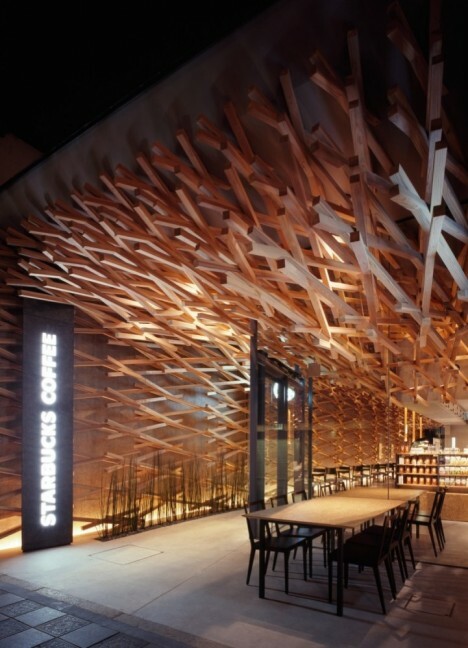 Adjacent to a Shinto shrine in Fukoko Prefecture, this Starbucks might be the most unique chain restaurant interior in the world. 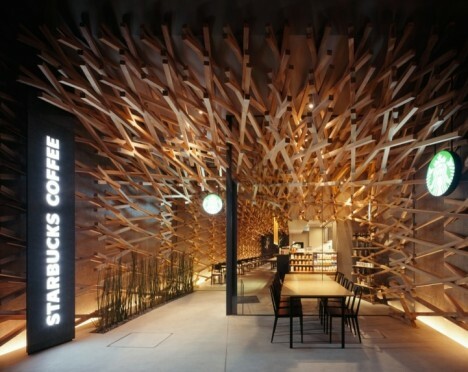 Architects Kengo Kuma and Associates created a thatched arrangement of over 2,000 wooden beams to give the cafe a nest-like feel. 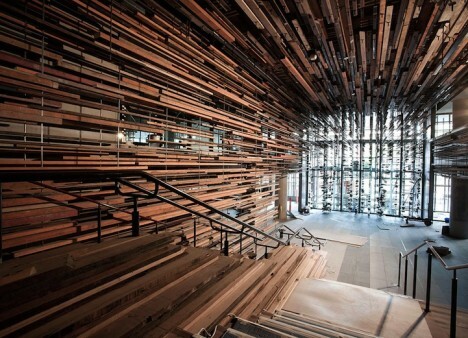 The installation takes inspiration from the limbs of trees and ceremonial lumber structures at the shrine.